Are you looking for things to do with kids in New England? Great Wolf Lodge is located just outside of Boston in Fitchburg MA. In addition to the 68 thousand square foot indoor water park and 11 water slides, there are also a number of dry activities that are just as much fun! 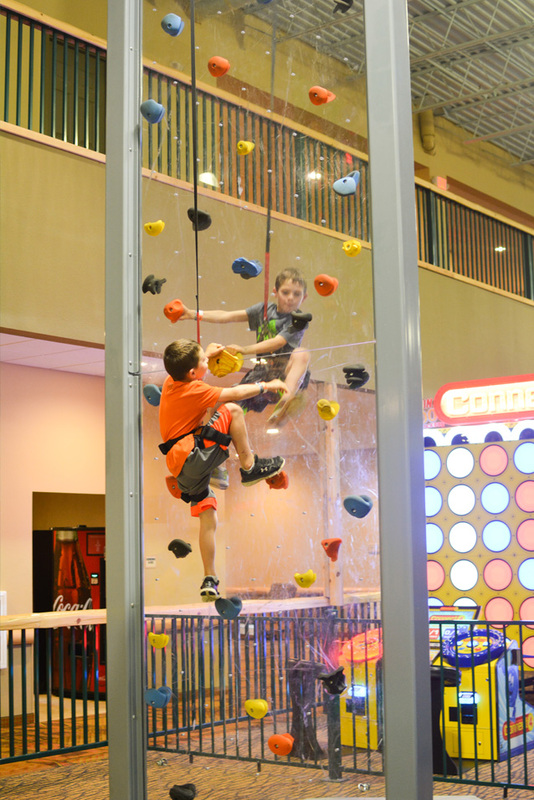 Activities include rock climbing, a ropes course, bowling, a magical wand game, arcade and more. Kids and teens will stay entertained for hours! Last week our family was invited to a day of play at Great Wolf Lodge New England to check out their newly upgraded version of the popular interactive MagiQuest game. 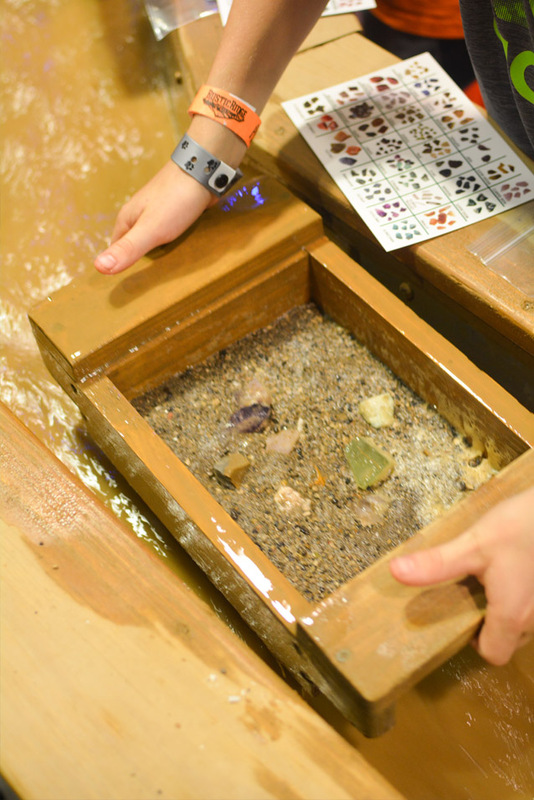 As well as the Northern Lights Arcade and Howlin’ Timbers Play Park that features a ropes course, climbing wall, mini golf, bowling, and Oliver’s Mining Co where guests can sift through sand to find beautiful gemstones. The kids have been asking to go back to Great Wolf Lodge for the past two years. 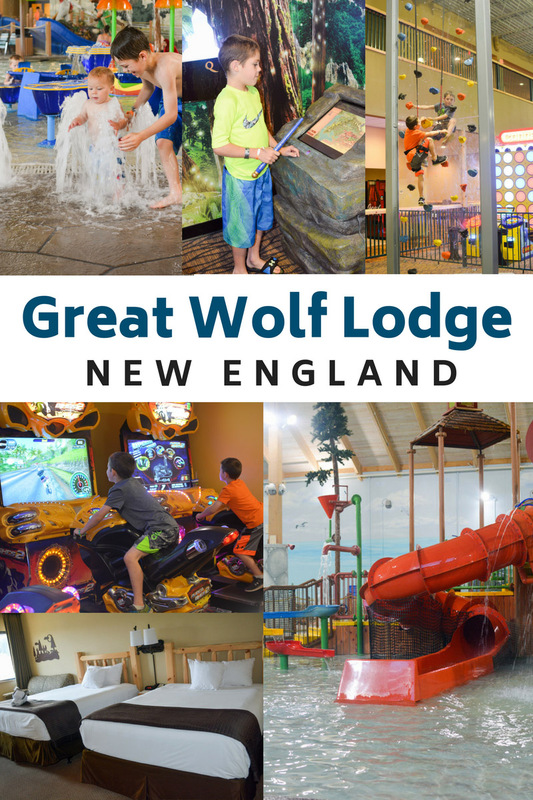 After our quick visit to Great Wolf Lodge New England in 2015, it has been their #1 request every school vacation. This time we had a new Wolf in our pack, baby boy, but unfortunately my husband was unable to make it on this trip, maybe next time! I’m looking forward to getting on the water slides myself. We did enjoy time at the indoor water park during our visit but majority of our time was playing the Maqiquest game and the Howlin’ Timbers Play Park. If you have the option of staying 2 nights opposed to one, I recommend it. With so many things to do with the kids, the time goes by quick and you need more than one day to fully explore the resort. We have only stayed one night each time, but would like to plan a future visit for at least 2 nights with our whole family. When it’s time to dry off, the fun doesn’t stop! Head to the Howlin’ Timbers Play park for some dry land fun! These attractions are not included with a standard overnight stay, but they can be purchased separately or through a play pass. A family vacation isn’t complete without a game of mini golf. 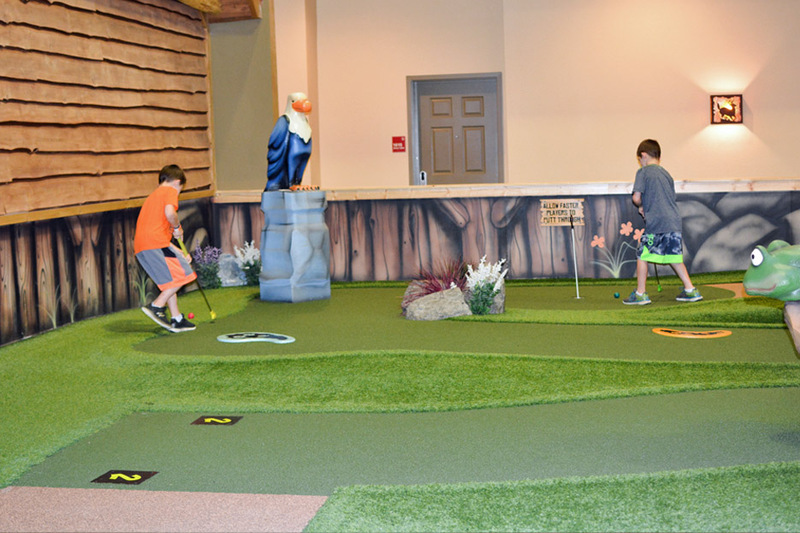 This indoor 12 hold mini golf is challenging, but easy enough for the youngest putters. 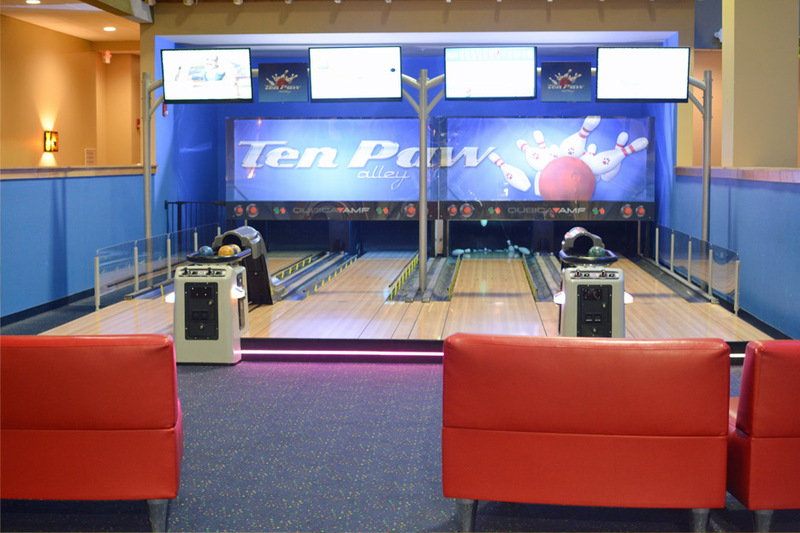 Enjoy a fun family game of bowling at the Ten Paw Alley, located at the back of the Howlin’ Timebers Play Park. Teens, adults and even toddlers and preschools can play with the half length lanes and 5 pound balls. What hidden gems are hidden in your sand? 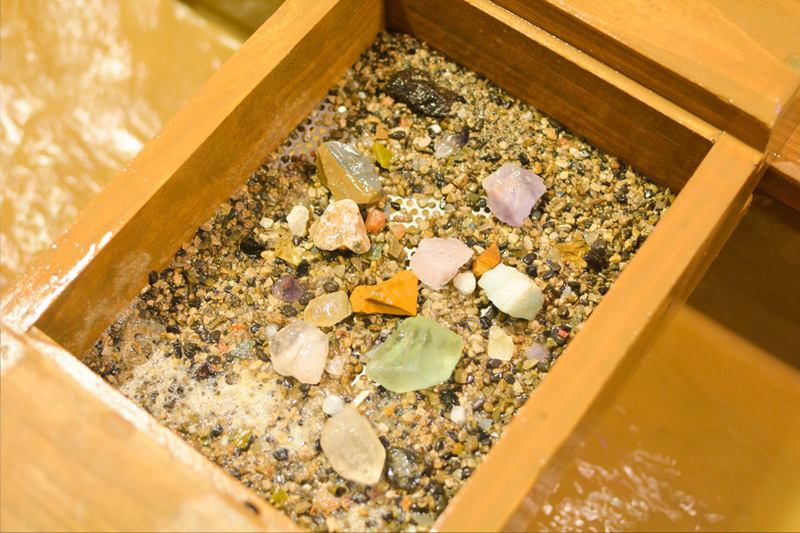 Sift through to find beautiful gemstones and minerals that you can take home along with an identification card. Three unique climbing walls for every skill level. Race a friend, try to beat your time, or explore different techniques as you climb to the top. 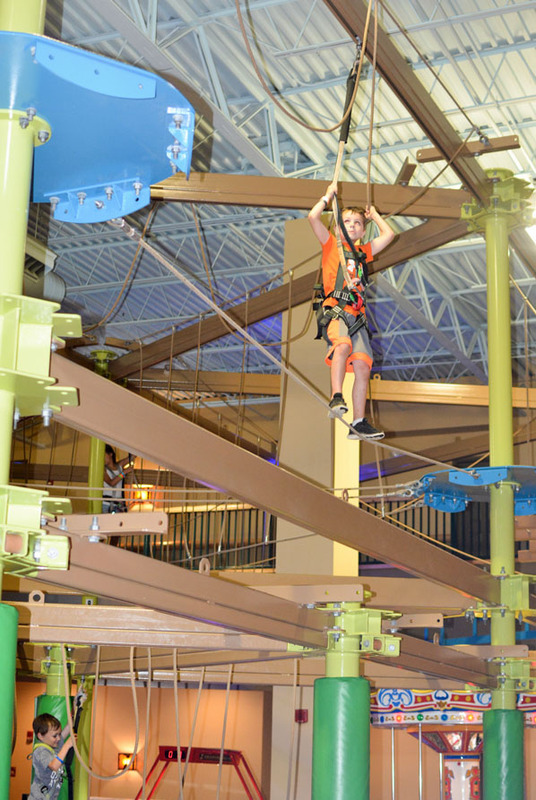 Balance on ropes, cross bridges and climb through obstacles in an aerial adventure on the Great Wolf Lodge ropes course. Make sure to pack clothes toes shoes as they’re required for the indoor ropes course. There is also a smaller ropes course for younger children. Celebrating a birthday? Make sure to ask for birthday ears at check-in. 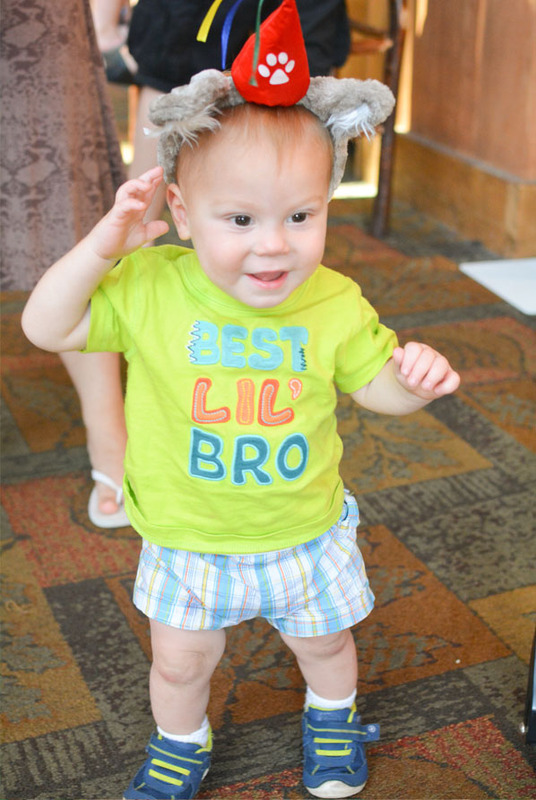 Whether you are planning your first visit, or second visit, check out our Great Wolf Lodge tips to make your trip an unforgettable experience.